Kitchen exhaust ducts have many important functions to perform. First of all, they must effectively carry hot, smelly, greasy air out of the kitchen and the building. Secondly, in the event of a grease fire, they must be able to contain the fire and prevent other parts of the building from being consumed. Keeping your ducts clean is a very important part of ensuring their continued safe and proper operation, and this task requires expert assistance and properly placed kitchen exhaust duct access panels. Flue Steam can help on both counts. Do You Have Enough Access Points? While grease builds up fastest on your kitchen exhaust hood, grease can also slowly accumulate on every surface of the ductwork over time, making it very important to get a thorough exhaust system cleaning that reaches into all the areas you can’t see. When your ducts were installed, they should have been equipped with various access panels to facilitate deep cleaning. Specifically, horizontal ducts should have at least one 20×20 inch opening so that maintenance personnel can crawl inside, or, failing this, they should have smaller access panels every 12 feet. Vertical ducts should have access panels on each floor. If you do not have enough access points to clean your ducts properly, Flue Steam can install additional access panels for you. Are Your Access Panels Code-Compliant? When you trust Flue Steam to install your additional access panels, you can rest assured they will meet the high standards necessary to protect your safety. 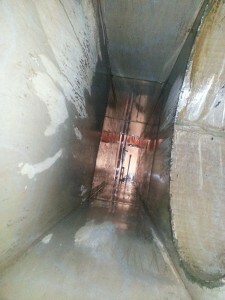 Is It Time for a Kitchen Exhaust Duct Cleaning? Of course, access panels won’t do much good unless you actually use them for frequent and thorough cleaning. Flue Steam can provide this service. We offer a combination of hand scraping and steam cleaning techniques to remove dangerous grease deposits from the visible and hidden portions of your ductwork. As a bonus service, we will also inspect your exhaust fan at every cleaning visit to help ensure that it draws properly and keeps your ducts cleaner longer.